HomeEmerging trends in global freshwater availability — @JayFamiglietti, et al. 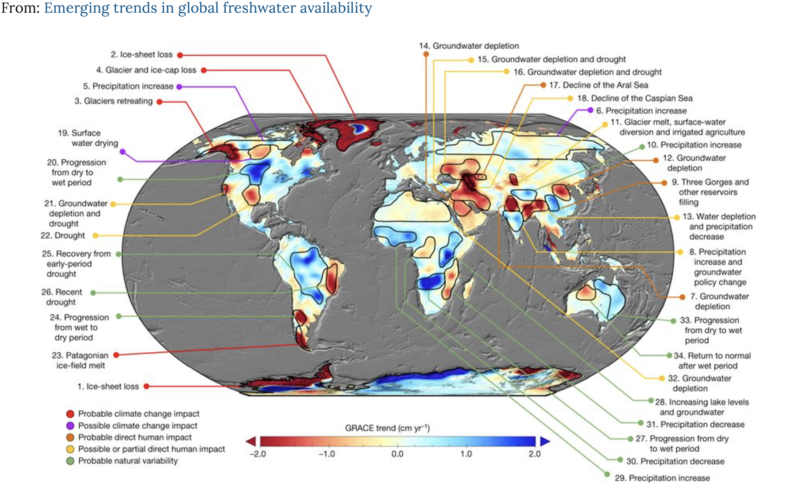 Emerging trends in global freshwater availability — @JayFamiglietti, et al. Trends in TWS (in centimetres per year) obtained on the basis of GRACE observations from April 2002 to March 2016. The cause of the trend in each outlined study region is briefly explained and colour-coded by category. The trend map was smoothed with a 150-km-radius Gaussian filter for the purpose of visualization; however, all calculations were performed at the native 3° resolution of the data product. Graphic credit: Jay Famiglietti, et al.